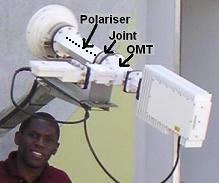 Circular polarisation is widely used at C band (4/6 GHz). It is ideal in tropical areas since the ionosphere causes changes in the rotation of the polarisation and this adversely affects linear polarisation. If you are in tropical area and using C band, then circular polarisation is preferred. The phenomena is called Faraday Rotation. It is far worse at low frequencies like L band (1.5 GHz) as used by Inmarsat, and negligible at higher frequencies like Ku band (11/14 GHz). How to set up a circular polarisation feed: Transmit = LHCP or RHCP ?. 1. The first thing is to get it quite clear from the service provider is what polarisation you are supposed to be using for transmit. There are two circular polarisations, one called Left Hand Circular Polarisation (LHCP), the other called Right Hand Circular Polarisation (RHCP). Next note the "number of optics" your antenna has. If may be single optic, which means that you have just one reflector, the large dish. In some cases antennas are dual optics which means there is a small sub-reflector at the front. This applies normally only to large teleport hub dishes and to a few older Ka band VSAT antennas like those used by Wildblue and Tooway. A few small high quality Ku band VSAT antennas have dual reflectors, the purpose being to improve the cross-pol performance, while keeping the front to back dimension of the whole antenna to a minimum. If you have single optic antenna then your feed faces backwards towards the main dish and the feed needs to transmit on the opposite polarisation to that required for the complete antenna. If you have dual optic then your feed faces forwards towards the sub-reflector, and towards the satellite, and the feed needs to transmit on the same polarisation to that required for the complete antenna. You should now have worked out what polarisation your feed needs to transmit. If you are not sure go back and read the above again. 2. A diagram is worth a thousand words, they say. Well maybe 200 words in this case. Here is the diagram. It shows a feed configured for transmitting on left hand circular polarisation LHPC. The feed system, for circular polarisation, comprises a conical feed horn, a polariser section and an ortho-mode transducer. The Polariser section is a circular or square tube with slots or pins along two opposite sides. Its purpose is to change linear polarisation into circular polarisation in the transmit direction and circular polarisation to linear in the receive direction. At the back of the polariser is a Circular flange with multiple alternative positions at +/- 45 deg whereby it may be attached to the matching Circular flange of the OMT. For circular polarisation the planes of polarisation in the OMT need to be at +/- 45 deg to the lines of pins or slots inside the polariser. The Ortho-Mode Transducer (OMT) splits the two linear polarisations apart into two waveguides, for transmit and receive. At C band the 4 and 6 GHz frequencies are far apart and need different sized waveguides. The larger waveguide is for 4 GHz and the receive LNB. 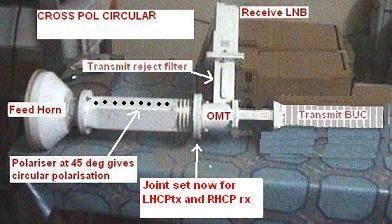 Normal Cross-Pol configuration with OMT: LHCP transmit and RHCP receive. This photo is the same as the diagram above. In a few cases you use the same polarisation for transmit and receive. This is called co-pol operation. In this case you do not have an OMT, you have a diplexer instead which splits out two waveguides, both on the same polarisation. Filters are used to split the 4 and 6 GHz bands into the different waveguides. See below. As shown the in the diagram, (with the LNB at the side) the feed transmits left hand circular polarisation. To transmit right hand circular polarisation undo the circular flange and rotate the OMT 90 deg and reattach with the LNB at the top (or bottom). In most cases, you transmit on one polarisation and receive on the opposite. This is called cross-pol operation. This feed transmits RHCP. 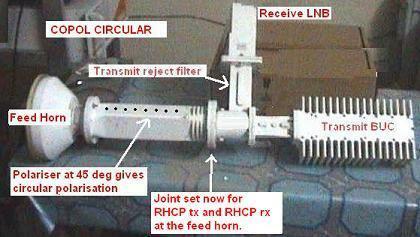 Whole antenna transmits LHCP. Cross-pol: This feed transmits RHCP. 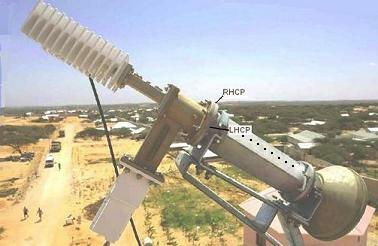 Whole antenna transmits LHCP. If you don't understand the above or are uncertain what to do, don't worry. Just put the feed together with the polariser at 45 deg to the OMT waveguides and you will have one of the circular polarisation settings. If it does not work, take it apart at the circular flanges and try the other polarisation. One will work perfectly, the other not at all. It makes no difference how you rotate the entire feed assembly. Orientate it so that rainwater does not run down the cables into the plugs. There is no need for any polarisation adjustment angle, as required for linear polarisation. Note that if you put the OMT and the polariser so that the pins/slots line up with a waveguide polarisation then the result is linear polarisation and the polariser appears almost "invisible"